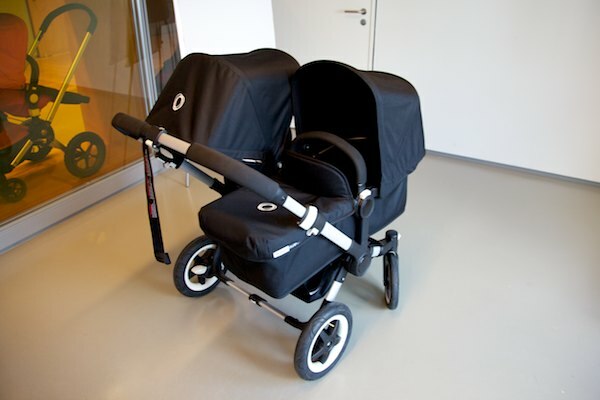 It really was love at first sight when I saw and test drove the Bugaboo Donkey in Amsterdam recently. It’s no secret that I am a huge Buagboo fan, having used three of their models (Cameleon, Bee and Bee Plus) with my children over the years. 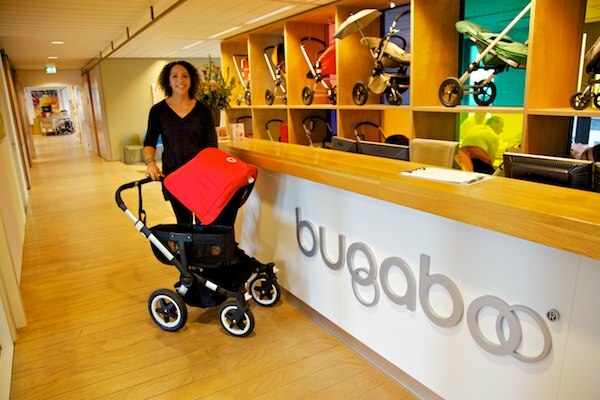 I really felt like I’d won a golden ticket to Willy Wonka’s chocolate factory when Bugaboo invited me to Amsterdam to meet the designers and people behind these incredible prams and to see inside their headquarters. This is the first of many posts on my trip to Bugaboo. I’ll cover the various collaborations they have put together, the office and people who make it all happen, the amazing Bugaboo display at Harrods in London and, of course, answer all your questions about the Bugaboo Donkey. I want to give you a full description of the Bugaboo Donkey, as this is what you have all been asking about. I learnt a lot about the Bugbaboo design principals and what makes them different. This is the exact pram I wanted in 2007 when my girls were only eighteen months apart. Mine must have been one of thousands of emails Bugaboo received saying ‘I love my Cameleon but when will you be coming out with a double pram?’. Little did I know it had been in pre-production for two years already, though still eons away from a release date. Meeting Product Manager Floor Post (you’ll see her in my video) and Creative Design Director Aernout Dijkstra-Hellinga (that’s him below) was an incredible experience as I managed to grasp just how important design and innovation is to Bugaboo. I’ll start with the timeline of this pram and how it all began with an idea on a ski trip way back in 2001. It took until 2006 for Aernout to have his two Donkey prototypes ready to go for consumer testing in New York and Amsterdam. Over the next three years, the prams were tested and refined over and over until an official design freeze so engineers could work on a final product. Even so, Aernout still snuck in changes to get everything just right. Finally, in 2010, the first Bugaboo Donkey emerged from the factory. 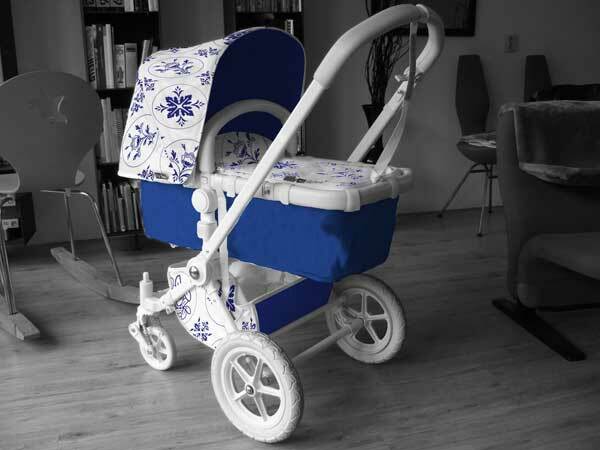 Watch Floor’s demonstration and marvel at this pram with me. I also have some shots of the pram in different folds to show the size when standing and folded for the car. In the mono configuration, the extra side basket is perfect for toting all baby’s gear – favourite toys, drink bottles, snacks and the like – because you don’t need to bend and reach under the pram all the time. The width is the same as the Cameleon but with much more storage. Second time parents might be wondering how long they will actually use a double stroller or whether the older child will want to walk when the baby is born? These are good reasons to buy a convertible stroller so you can adjust the stroller to your needs. For twin parents, the biggest concern might be leaving the house. This stroller is so light and manoeuvrable I found it easier and lighter to push that the Bugaboo Cameleon. The designers have tried to think of absolutely every feature and functionality when putting together this pram, including the slick sound the canopy makes when opening and closing. All the white buttons have the same radius, feeling and texture as it affects the perception of the quality of the product. The human eye is trained to find differences, if a small detail does not fit, people notice this. The tyres are all large air filled multi-terrain wheels as this is best for the weight distribution. Many readers have asked if it feels lopsided when pushing a newborn and a toddler. The new wheels help the weight distribution if the children are different ages. The extra storage space is amazing for all those baby items, groceries, the laptop, camera and much more. The side basket is easily accessible and comes off so you can bring it inside when you get home or when visiting a friend. They are considering designing a closed basket which will be sold as an accessory…..ssshhh! The duo stroller has two independent seats with known Bugaboo functionalities and complete flexibility for parents – a challenge when designing a compact duo solution. The seat recline button is a new mechanism and much easier to use with only one hand rather than the previous two side buttons. The breakthrough mono to duo convertibility is phenomenal and done in three easy clicks with no additional tools. The designers paid a lot of attention to the manoeuvrability and you really can steer the stroller with one finger. What I love most about the Donkey is the flexibility on a daily basis to suit your needs. If you have a newborn and are walking your toddler to pre-school, simply leave the seat at kinder and in three clicks you have a single pram for the day. If you are going into a cafe or narrow doorway, your toddler can stand up and walk, you can transform the pram into a single, and once inside, pop it back to a double very easily. I was often pushing around my old-style double pram when my toddler was not with me for the day and it was not ideal since it was a side-by-side. The stroller weighs thirteen kilos, each seat can hold seventeen kilos, the side or bottom basket can hold ten kilos and then you can also have a toddler board attached. The width of the mono Bugaboo Donkey is 60cm (which is the same as the Cameleon) and the duo Bugaboo Donkey is 74cm wide. This is the narrowest luxury side-by-side duo pram on the market. Car seat compatible for one or two children, just click the seat into the frame. 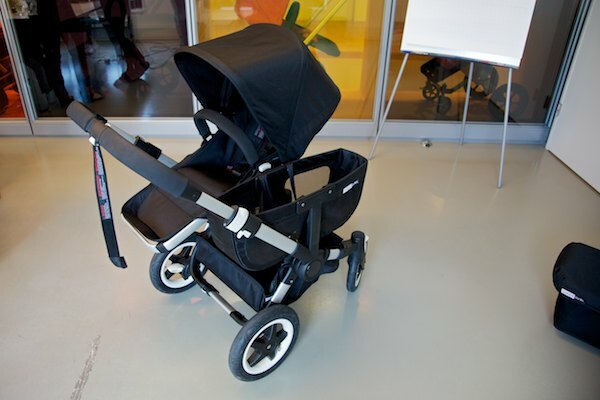 The Bugaboo Donkey team comprised two designers and fifteen engineers as it was such a challenging design. Aernout has been at Bugaboo for eight years, the last six years designing the Bugaboo Donkey. The engineers worked on each prototype from 2007 until the 2010 release. 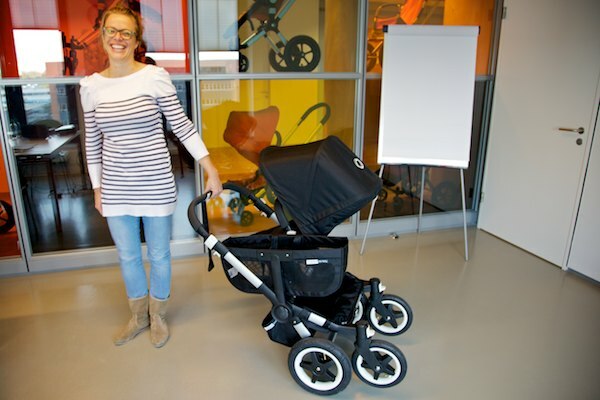 Aernout tells us: “The biggest challenge was to have the stroller as narrow but to offer as much space as possible. 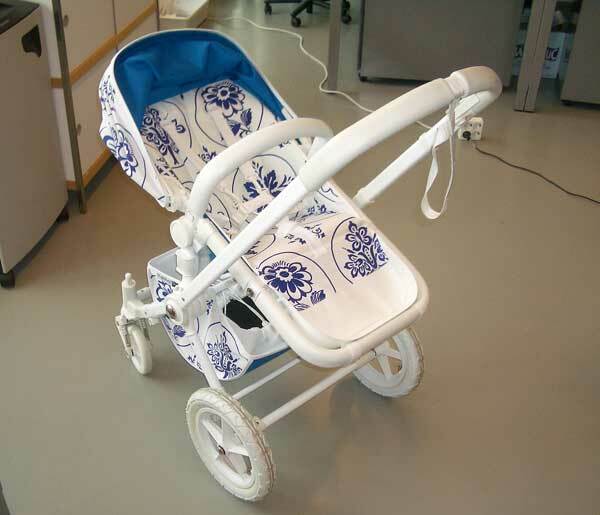 This led to a lack of space for the mechanical parts, which created issues between the designers and the engineers for the pram to be safe and durable, but also to keep all of the design elements. 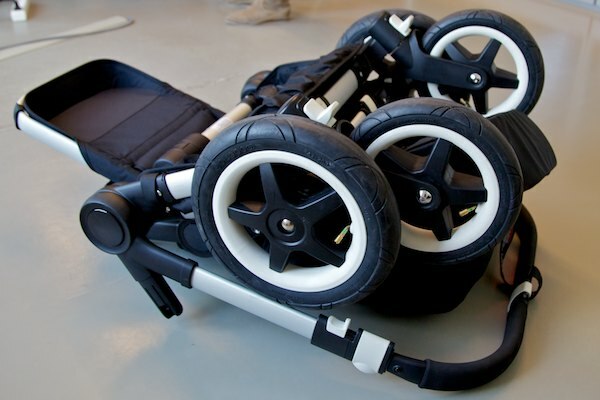 With over five hundred parts in the Bugaboo Donkey, it is a very complex design.” Indeed. Aernout is incredibly proud of the Bugaboo Donkey and the amazing feedback coming from consumers. The stroller has won several awards already but he already wants to tweak the current model, with an upgrade mooted at the end of 2011. In the world of Bugaboo, this means a few years before a public release. “No matter how well designed a product is there are always comments and new ideas or ways to change a current design to make improvements, which is very valuable,” Aernout says. I asked Floor and Aernout about their all-time favourite Bugaboo stroller designs. Floor likes the all-black or sand and off-white models. Aernout designed his own Delft blue version, pictured below. He created this one-off design because his wife is born in Delft, they both studied industrial design engineering in Delft, and they met and lived there for a while. It’s also a very Dutch design and he drew all the tiles himself. To top it off one of the tiles contains Jasmines because his daughters name is Yasmijn (translated to Jasmine)… aaaaawwww. If you are considering the Bugaboo Donkey, check out our Pram Chooser to compare single and double prams currently on the market and also see our past content on the Bugaboo Donkey. The anticipated Australian release date is still not official but I believe it will happen sooner than the first quarter of 2012 original date. If you are currently pregnant with your first, are going to have two children close in age or are expecting twins, I’d say this is the pram for you.